One of the Hachiyō, he is the Genbu of Earth. Yasuaki is an Onmyōji, and the successor to the famous, historical Onmyōji Abe no Seimei. 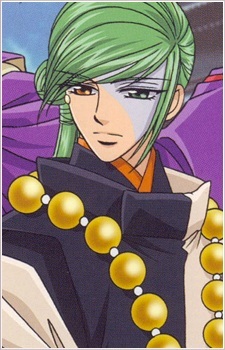 Unlike his fellow Hachiyou, Yasuaki was not "born" a human, but created through Abe no Seimei's magical skill, and crafted into his current form through that same ability (in the manga he even talks about Seimei using a Tengu's power to help form him, although this is not explained in the anime). For this reason, despite having the physical appearance of a twenty one year old adult male, Yasuaki has only actually been alive for two years. This in many ways explains his emotional simplicity and naivety, since he has not yet learnt many of the things his companions have grown up absorbing. For the most part, Yasuaki is a composed, detached individual that operates largely on logic and is sometimes perceived as cold or strange. When it appears that Eisen will die if he exorcises the eight-stringed Kin, Yasuaki states the fact bluntly and without any concern because he sees it simply in black and white - to save the Miko, a Hachiyou must be prepared to do his duty. As he puts it - "If there is no Miko, there is no point in the Hachiyou." When Yasuaki was "born", Seimei told him he had been born to find someone important to him, and that he lacked something as a person - a heart - which could not be crafted. For this reason, Yasuaki has accepted his master's words as meaning he's not a "real person", and therefore does not count in the same way as his Hachiyou companions. He believes he is the Miko's "tool" - in the manga, he is worried that he is "broken" because he can no longer read Akane's heart (although Akane explains to him that that just makes him like every other person, and that he's not broken at all) In the anime he tells her that "a tool that no longer works has no option but to be destroyed" after Shirin tells him that he will never be able to find the Northern Seal. In the anime, his ignorance of human feelings make him tell Ran the memories that to that point had been concealed from her, driving her back to the Oni clan and causing a lot of trouble for the Hachiyou. In the manga, it is when he releases Kotengu's seal and sends him into battle against Ikutidaru, only to have the creature apparently slain at the demon's hands. Yasuaki has many odd habits during the anime and the manga - including talking to trees, possessing small animals to convey messages and even casting spell dolls to help him do the cleaning. Although undoubtedly the most powerful of the Hachiyou at the start, he is also probably the most vulnerable on account of his background and his origins. Yasuaki's developmental stages and childlike naivety are more clearly outlined in the manga, also - at one point, he asks why people tell lies, but later winds up lying to Akane himself to protect her from the grief of Kotengu's apparent passing away. This act tortures him for some time afterwards and he withdraws from Akane's company completely, convinced she must be angry with him for telling her a lie. Yasuaki's most commonly said phrase in the manga and the anime is (mondai nai - no problem), a catchphrase which was even picked up on and exploited in one of the live Haruka Matsuri festas. He also often says (wakaranai - I don't understand) - usually when relating to some human nuance that he hasn't managed to grasp yet.